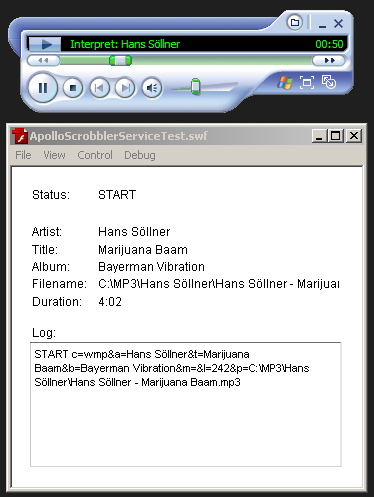 I have been toying around with the idea to write an Adobe Apollo application that’s able to monitor your favorite media player (such as Winamp, Windows Media Player, iTunes, Rhythmbox, etc) for play back status and song information. Last.fm provides an application along with plugins for pretty much all existing media players on all major platforms (Windows, MacOS, Linux, etc) that does exactly that. During installation of the Last.fm client, the user is prompted to install the required plugins for the media players she uses. 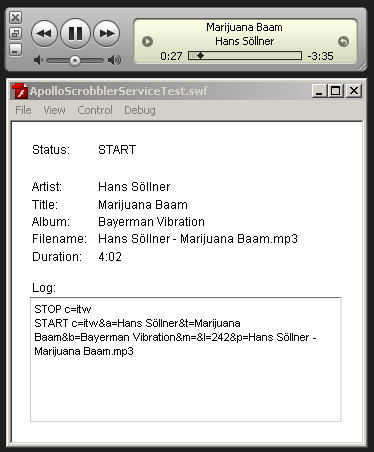 When a media player executes and plays a song, the plugin establishes a TCP socket connection with the client application and sends status and song infos. The problem: The Apollo runtime (alpha) that is currently available on Adobe Labs doesn’t provide any documented way of (a) talking to shared libraries, (b) launching executables or (c) serving as a socket server, and Adobe indicated that Apollo likely is not going to support those features in it’s 1.0 release version. There is hope though. Afaik, the last word on launching executables at runtime from an Apollo app isn’t spoken yet, and there exist some undocumented hacks that enable Apollo apps to do just that. If Adobe should decide against letting apps launch executables, then the only way of solving it is to provide second installers that install a socket server of some sort to do the dirty work. However, i sat down last night and wrote a proof of concept Flash application that can live in Apollo, which talks to a custom daemon via sockets. The daemon in this proof of concept runs as a Windows Service. I took the Last.fm iTunes plugin and modified a bit so that it also connects to that daemon. The daemon then simply echoes the messages it receives from the Last.fm plugin to the socket listener in Flash. Voilà. 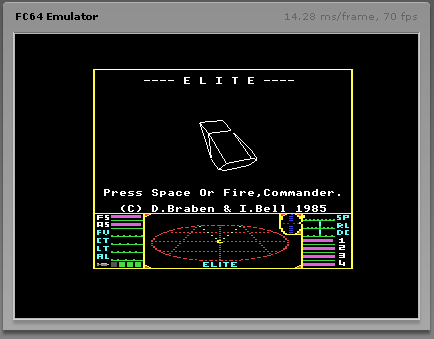 Note that this is only a proof of concept, and sources aren’t ready for release yet. I would very much like to make this an open source project (The Last.fm plugins are released under GPL), so if there are any interested developers out there who like to help, please contact me or leave a comment. Thanks! Just to let you know that i’ll be speaking at the 9th annual Flashconference in Stuttgart, Germany on May 4th. My presentation is about the new Actionscript 3 Flash UI Components that come with Adobe Flash CS3. I’ll give an overview on what’s new, what’s different with respect to previous components sets and Flex, if and how to use them and how to skin and subclass them. I was part of the CS3 components dev team together with the guys at gskinner.com so hopefully i have some interesting things to show. If things work out well i’ll probably also be showing some FC64 stuff i was working on lately. If you’re in central Europe early May, please drop by. Among others, Mario Klingemann, Andre Michelle, Peter Elst and Marcos Weskamp will be presenting, and as the flashconference is taking place as part of the fmx (“12th International Conference on Animation, Effects, Realtime and Content”, May 1st-4th), there’s almost a full week of top notch events to attend. I’ll stay in Germany for two weeks and will be traveling Munich, Stuttgart and Bremen, so if you like to meet, please drop me a line! The DENG Modular XML Browser project finally has a new home. Over the last two years, i switched hostings twice (don’t ask), and DENG was scattered all over the internets, and many things got lost. I finally sat down to clean up the mess and everything is in one place again. The project homepage features a small news section, the feature matrix, examples (i’ll add more every now and then, so be sure to check back), downloads (includes examples on how to integrate DENG into your Flash projects and HTML pages as well as the source code of course) and support (you can support us by donating via PayPal now, and we can support you via our forum and mailinglist, and we offer individual support too). Nothing terribly new there, but i thought i let you know. I’m working on DENG 2.0 (Actionscript 3 implementation) whenever i find some free time, so stay tuned. May take a while yet though until i have something halfway meaningful to show. An old friend of mine from Argentina contacted me recently and showed off his work. I was impressed. 6kbytes.com integrates all your messenger accounts (MSN, Yahoo!, ICQ, IRC) into one slick Flash 8 interface. And it’s all free. As far as i understood, communication is done via XMLSockets to a Jabber server that is used as a gateway to other messaging servers/protocols.